DP national chairman Mayambala arrested as party officials were protesting age limit bill. Photo by Raymond Mayanja. KAMPALA–As Parliament continues to discuss the Presidential age limit bill, the Police are still heavily deployed to man security in the city and its suburbs. PML Daily has learnt that over 8,000 security personnel are deployed in the city centre and the suburbs. Most of these security personnel are located at Parliament, City Hall, junctions at Bwaise , Kibuye and Nakulabye. Security is also highly beefed in other areas of down town near Owino market and Kisekka market. 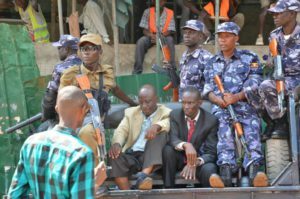 Frank Tumwesigwa, the Kampala Police boss, during an interview with PML Daily said the deployment aims at blocking the Opposition from disrupting businesses in the city. “But this is usual security routine we normally conduct during Christmas holidays in some parts of the city,” Tumwesigwa added. Last week, Police heavily deployed at Entebbe Airport, after receiving reports that some opposition legislators with VIP passports were planning to disrupt business, targeting mainly diplomats and government officials using the VIP lounge. Meanwhile, as the Speaker of Parliament Rebecca Kadaga was suspending seven MPs, some DP officials were on the streets protesting. Led by the party national chairman Dr. Kiwanuka Mayambala, they were intercepted at the party headquarters as they proceeded to Parliament. Mayambala and other party officials were arrested and detained. Mayambala, one of the brains behind Togikwatako, which literally means don’t dare to touch the Constitution, said their arrest will not deter them from blocking life Presidency. “Unless, we stand up an be counted, my fellow country men our country is heading for a political crisis,” Mayambala told PML Daily. Kadaga on Monday morning suspended seven MPs following a heated debate on the age limit bill that is currently in the House for the second reading. Those suspended were Ibrahim Semujju, Gerald Karuhanga, Mubarak Munyagwa, Moses Kasibante and Allan Sewanyana, among others.